Farrar also delivers with reflective tunes like miner-ballad "Shaky Ground" and closer "Wipe the Clock". Jeff Tweedy continued to refine his songwriting style, contributing two brooding classics in "Black Eye" and "Fatal Wound". The instrumental "Sandusky" (which was featured in Jud Apatow's Knocked Up) is a breezy ramble with a great riff. The best thing I can say about the album is that it never feels like a gimmick. Well, almost never (see below.) You don't pine for the electric bashing of its predecessors. 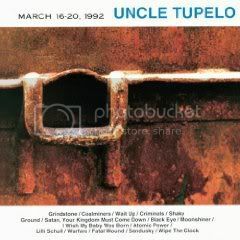 March 16-20, 1992 doesn't sound like a departure; it's every bit as representative of what Uncle Tupelo was as any of their albums. 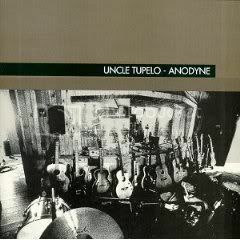 Why It Might Be Tupelo's Best Album: Not unlike Yankee Hotel Foxtrot some years later, Anodyne's legend is borne out of both the music and its backstory. At this stage, Farrar was ready to walk. There was a great deal of fluctuation in the band at this point: New label, new drummer, expanded roster. John Stirratt (who's still in Wilco) took on bass playing duties, allowing Tweedy a full-time move to guitar. Whatever the reason, the relationship between the two had fizzled. As I said, it's hard to imagine one band sustaining those two egos as long as it did. Soon after the release of Anodyne and the ensuing tour, the band was kaput. But as we learned with Fleetwood Mac's Rumours, tension often breeds inspired work, and such was the case with Anodyne. no more will I see you." If Farrar was feeling protective of his role, he certainly made a greater case than ever for still being a songwriting force. Including from the aforementioned pair, his contributions are all four and five star efforts, most notably the vintage Tupelo rocker "Chickamauga" and the shuffling "Fifteen Keys". Tweedy's lyrics weren't so biting as Farrar's, although he did take a bite out of pop-punk and grunge rock with "We've Been Had." And "The Long Cut" could also be viewed through the lens of the state of Tupelo. But his more light-hearted tunes win the day. "New Madrid" is one of my personal favorites, a bounding acoustic diddy about an erroneous end-of-days theory, oddly enough. And "Acuff-Rose"--a knee-slapping fiddle fest that leads you to believe a ho-down could break out at any minute--is still played by Tweedy to this day. The album is so emotionally rich, wrought with both sorrow and joy, and created by a band that literally had no notes left to play. The album's title is so fitting, too: An anodyne is essentially a painkiller, and metaphorically refers to words meant for healing purposes. The music on the album--more poignant and mature than anything they'd offered to date--might have afforded them both some sort closure, or at least enough to close the book on Uncle Tupelo. Why It Might Not: Tweedy's only average contribution was "No Sense In Lovin'", which may or may not have had any involvement from Farrar (this is just speculation, but he sure doesn't seem to provide any backing vocals.) The song doesn't leap off the record like most others do, sounding more like a b-side from Wilco's A.M. than it does the penultimate track on a classic album. The only other chink in Anodyne's armor is its lack of Mike Heidorn's contributions. While the skins were more than ably supplied by future Wilco/Gourds drummer Ken Coomer, it strikes me that Tupelo at its purest was the trio of Farrar/Tweedy/Heidorn that rampaged through No Depression and Still Feel Gone. The same philosophical question arises as did with March 16-20, 1992: If the overall quality of music doesn't suffer, does it matter? To some degree it does. If either Tweedy or Farrar had left the band, it wouldn't be Tupelo (and it wasn't, since Wilco was essentially Anodyne-era Tupelo minus Farrar.) Mike Heidhorn brought his own style and attitude to the drum kit, as the drumwork on the first two albums was starkly different than the last two. Mirroring the point I made with March 16 as it relates to electric guitars: Is it fair to coronate Anodyne despite Heidorn's absence? It's a debate of whether his relevance outweighs the quality of music.